Dessislava Stefanova has been performing and teaching the distinctive choral music of Bulgaria in the UK since her arrival here in 2000. An experienced conductor, soloist and ensemble singer, Dessi has also established a career singing for film soundtracks, theatre and working with artists who need the authentic sound of her homeland. Dessi started western classical music training at the age of six, but found an alternative to the formality of communist-style musical education in the Childrenís Folk Music and Dance Company Zagorche, based in her home town of Stara Zagora. With this acclaimed troupe, she toured all over Europe and experimented in theatre and improvisation. After leaving Stara Zagora to study linguistics at Sofia University, Dessi successfully auditioned for the world-famous Philip Koutev National Folk Music and Dance Ensemble, and continued her career as a professional singer with the ensemble until leaving for the UK. She arrived in London in July 2000 to find a keen audience for her thrilling and evocative vocal style - and an eager community of would-be Bulgarian singers. The popularity of her workshops rapidly led her to form the London Bulgarian Choir, and she continues to lead the choir from strength to strength. In 2008, Dessi was awarded an MMus with Distinction in Music and Performance from SOAS (The School of Oriental and African Studies, part of the University of London). The first professional vocal group Dessi established in the UK was the Dessibelles vocal trio in which the velvet voices of British singers Lucy Gibson (co-director of Maspindzeli Georgian Choir) and Wendy March melt with Dessi's bright tones to create a resonant vocal texture which delights audiences all over the UK. Dessi is part of unique story-telling company A Spell In Time, bringing Bulgarian stories, myth and music (which Dessi co-writes) to British audiences in the form of primal theatre. From 2001-2003 Dessi performed Bulgarian and Balkan music with Izvor and Dunav. She also performs selected concerts with renowned medieval ensemble Joglaresa and with the groovy New York-based mixologists Balkan Beat Box. 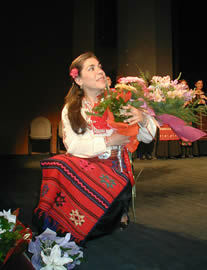 She has recorded in various musical genres with Joglaresa, Oi Va Voi, and The Ailerons. Dessi has led the full choir in major concerts with British Sea Power (Roundhouse and Regent's Park) and Doves (Roundhouse). Regularly consulted on sources and authenticity of Bulgarian music, Dessi has lent her own unique voice to numerous soundtracks for Warner Brothers, Miramax, 20th Century Fox, Walt Disney, the BBC and HBO. Dessi brings emotion and intensity with performances at key moments in The Brothers Grimm, Elizabeth the Virgin Queen, Troy, Ghost Ship, Atlantis and Borat. In 2002 Dessi released Wild Wind - the first ever CD course in authentic Bulgarian singing. In easy-to-follow steps, she introduces the vocal techniques, harmonies, ornaments and rhythms which make Bulgarian music so stunning, evocative and sublime. Dessi has been interviewed on numerous radio and television programs in Bulgaria and the UK, including a 60-minute section of BBC Radio 3's The Choir, broadcast on 18 February 2007. On Christmas Day 2005 Dessi presented a BBC Radio 3 Sunday Feature: Bulgariaís Voice, which was selected for Pick of the Week. In 2006, Dessi and the London Bulgarian Choir were the subject of a 30-minute documentary on Bulgarian television. In 2008, Dessi was interviewed on Radio 3's World Routes, and Radio 4's Joan Armatrading's Favourite Choirs. For the 2009 BBC Electric Proms, Dessi worked with composer Avshalom Caspi on a large-scale collaboration with Doves. The 75-minute concert involving the full choir was performed at the Roundhouse and broadcast live on BBC2. Dessi and the choir have worked closely with British Sea Power for a variety of events. Those broadcast include Later... with Jools Holland, the Glastonbury Festival and the Nationwide Mercury Music Awards. Dessi offers private lessons, and leads public workshops for many choirs, universities and creative organisations in the UK and Europe. If you would like to bring the joy of Bulgarian music to your own choir, vocal group or company, Dessi has a variety of one-day workshops for up to 40 people of all abilities, and can work with you to find appropriate songs to be taught by ear to your group. On arrangement, Dessi can bring song sheets, music, audio tracks of workshop songs by part, and commercial CDs of hard-to-obtain Bulgarian music.